The world's most versatile tool has got to be the Dremel rotary tool. I first saw this in a friend's house in Sydney some years ago. He was an avid DIY (Do It Yourself) person and made little military models. He told me a few things about the Dremel. He of course had a whole little workshop with pretty nifty tools and accessories. It was quite fascinating. I fogot about the tool until I spotted it many years later at a store in a Noida Mall. It wasn't exactly cheap but I bought it anyway. And I have not regretted that decision. For, the tool has helped me fix, improve and make many little things around the house. If you are planning to take up DIY, I reckon you should get hold of this tool. 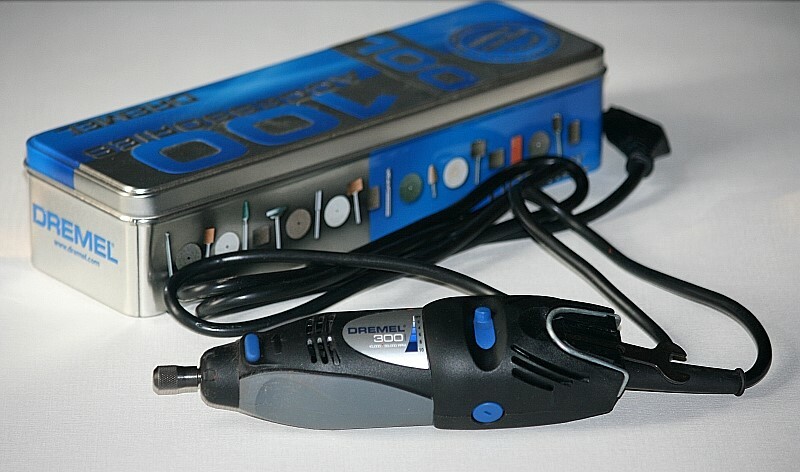 In India, Bosch markets the version 300 of the Dremel Rotary Tool. Its very widely available in Delhi and the NCR, thanks to Bosch. At least Indian customers have access to the tool. But at a hefty cost. Bosch has priced the machine at more than double what it costs in the United States! Go to www.amazon.com and do a search on Dremel 300 and you will get many offers at less than 50 dollars a pop. Here it is sells for more than 100 dollars (MRP Rupees 4800)! If that isn't a rip off, tell me another one. Moreover, Bosch does not market the newer versions of the tool or the cordless ones. Bosch, like most multinational companies, believes that India is a good market to dump older products. It is also extremely difficult to get hold of the accessories and attachments needed to make the most of the Dremel tool. I have got most of these from the USA through friends. Enough of carping though, I am glad that I have the tool and can do things with it. So what's so special about this tool? Well, basically its just a rotary tool like a drill. The neat thing about it is that it is designed to be held in the hand to do various tasks like sanding, deburring, removing rust, polishing, carving, cutting and so on. All you need to do is change the accessory. I first used it when I was putting up some curtains in one of our bathrooms. With a cutter attached, I could easily slice through metal and plastic rods. Then trim the ends by sanding them to give them a finished look. It was easy. I use it regularly to clean my rusting steel door and window frames. It is extremely useful for woodworking, especially when the project involves parts that are small and delicate. You can use the tool as a cutter, a router and a drill. There are many tasks that I would not dream using a regular router - not even a hand held one - for which I would use the Dremel. Then there is cleaning up and sanding small areas, curves, grooves etc. that can only be done with the precision this tool offers. I will talk more about how to use it in the next section. But before that if you are really curious, you could check out the Dremel website for more information. I really like the Dremel tool for its sheer versatility and especially the one with the flexshaft. They are a bit pricey, but this tool has so many attachments that I am pretty i would find work for them. I actually have this on my wishlist and have seen quite a variety on Machpowertools.com with a lot of attachments available. I would suggest you check them out. Yes, Karl, I have the flexishaft and a bunch of other attachments and accessories. I also use it for very fine, shallow routing. I'm planning to take up woorkworking as a hobby, and was wondering if the Dremel rotary tool, Dremel saw-max, and dremel multi-max are good enough tools.